Cyclone is the tale of a radically awesome motorcycle and the people that want to get their hands on its secret energy source. Jeffrey Combs plays Rick Davenport, a nerdy, scientific type who has developed the multi-million dollar “Cyclone”, and even its helmet, which shoots lasers. For some reason, this dork’s girlfriend is Heather Thomas, who’s the hottest thing on two legs. When evildoers kill Rick (not a spoiler because it happens so early on in the film), it’s up to Teri Marshall (Thomas) - presumably no relation to Joe “Samurai” Marshall of Samurai Cop (1989) infamy - to protect the “clean energy” source. Everyone wants this thing, and there’s a conspiracy that goes all the way to the top - the big boss causing all the conflict is one Bosarian (Landau), the man sending out all the goons. Will Teri ride off into the sunset on the Cyclone? Director Fred Olen Ray assembled a major cast for this one - besides the aforementioned Thomas, Combs and Landau, we also have Martine Beswicke as a police chief, Troy Donahue as Rick’s old contact, and they even dug up the legendary Huntz Hall, whose extensive career goes back to the thirties. Tim Conway, Jr. and Michael Reagan are teamed up as two of the dumbest cops in movie history. I wonder what their fathers would have thought. Bruce Fairbairn is on hand as Lt. Cutter, while Dawn Wildsmith plays one of the female baddies. A standout scene occurs when Rick and Teri pay a visit to the Lava Club to see a band called Haunted Garage. A lot of funny dancing is seen, as well as Teri’s memorable outfit. The band doesn’t seem that talented musically, but they are able to crank out their signature tune, “Devil Metal” with aplomb and it will be stuck in your head for days. Speaking of the music, Joe Pizzolo provides the moody anthem “Are You Too Tough” as well as the memorable “Riding on the Edge of Night”, which provides the soundtrack for Teri riding the Cyclone down the streets of L.A. This guy could easily be the next Robert Tepper. 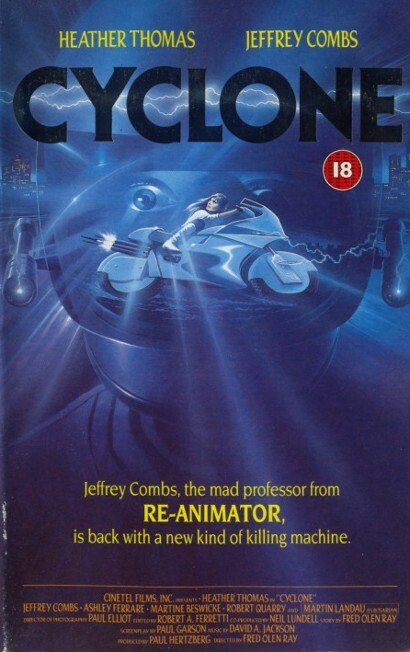 Because some of the themes in the movie revolve around clean energy and leaked information, Cyclone seems pretty ahead of its time. But really, it’s just comic-booky good fun and not meant to be taken all that seriously. It appears fairly tongue-in-cheek in the classic Fred Olen Ray way. Thomas carries the movie on her looks alone, but she is amply supported by an army of B-movie names in this somewhat fluffy outing. It ends with some impressive stunts and explosions, after the prerequisite chase scenes. I think there’s even a “NOoooooo!” somewhere in the mix, but the beeps and lasers coming from the soundtrack/Cyclone are pretty distracting. Lastly, the film is dedicated to Dar Robinson, the legendary stuntman and actor. His final acting role was as Rolf in this film. For the cast and to see Heather Thomas, Cyclone is worth it. Also helmet lasers. Cool! Looking forward to your take on it lizzardking! I always found that image of heather thomas over the bike pretty odd. But then again, I always confused her for Heather Locklear. I definitely enjoyed Cyclone. Makes me want to revisit it. I skimmed the review just because I plan on seeing it sometime too, but it looks like a fun time. I like the idea of Fred Olen Ray, Heather Thomas, and Martin Landau. Cinema Du Meep: Agreed. Heather Thomas and Heather Locklear do look very similar. Happy you enjoyed the movie! DTVC: It is definitely a lot of fun! Martin Landau was slumming, but he did a good job in it. Now this sounds like my kind of movie! Too bad the Re-Animator dies so early though - I love some cheeseball Jeffrey Combs action. You will definitely enjoy it, Michael! Jeffrey Combs is awesome. Wished he was in it more.